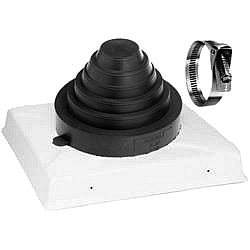 SPECIFICATION: Compression molded EPDM rubber caps provide the flexible seal at each penetration. Stainless Snaplock Clamps provide an added measure of assurance at each penetration. The flexible EPDM caps are mechanically sealed to the Pipe Portal cover by a double "Weather-Tite Pressure Seal", which consists of two beads formed into the collar of the cover that mate with double grooves molded into the inside of the cap. The curb cover is molded of one piece ultraviolet-resistant ABS plastic and laminated with an acrylic coating for extra protection. This manufacturing process creates exposed materials that are both ozone and ultraviolet resistant with a serviceable temperature range of -40F to +160F. To complete the system, the roof curb base (NOT INCLUDED) is fabricated from heavy 18 gauge galvanized iron with mitered and welded corners and insulated on all four sides.